US President Donald Trump blasted Democrats as 'anti-Israel' and 'anti-Jewish' after they passed a congressional measure. Washington: US President Donald Trump blasted Democrats as "anti-Israel" and "anti-Jewish" Friday after they passed a congressional measure opposing hate speech in general instead of specifically condemning alleged anti-Semitic comments by a Muslim congresswoman. The remarks by the Republican leader follow days of tense debates in Congress addressing sensitive questions about national allegiance, age-old discriminatory tropes aimed at Jews, and accusations of show votes that failed to call out a member for controversial comments. 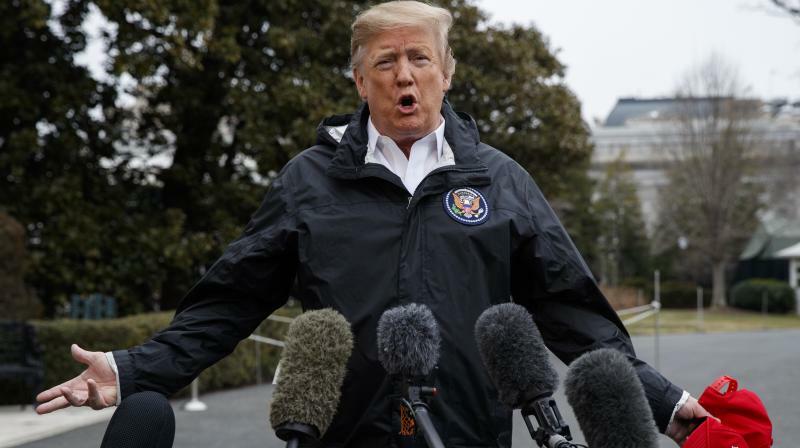 "I thought yesterday's vote by the House was disgraceful," Trump told reporters at the White House. The resolution was originally intended to deliver a direct rebuke of anti-Semitism following controversial comments by a Muslim Democratic congresswoman, Ilhan Omar, that were deemed anti-Semitic and offensive by many colleagues. But after blowback from progressives, it was revised to more broadly condemn discrimination against Muslims and other minorities as well. Trump seized on the shift, and the tensions among Democrats. "The Democrats have become an anti-Israel party and anti-Jewish party," he said. The issue has caused a deep rift. Some Democrats wanted to include language condemning other forms of bigotry, and expressed concerns about singling out Omar. The resolution, which made no mention of Omar, ultimately passed 407 to 23. Republicans who voted against it complained it had been watered down. The debate made clear that Democrats' growing diversity in Congress -- in ethnicity, religion, gender, age and ideology -- has created new challenges for the party. Among those is policy about Israel. Omar had sparked fiery debate with her repeated criticisms of Israel and how a powerful pro-Israel lobby in Washington exerts influence on US politicians. "I am told everyday that I am anti-American if I am not pro-Israel. I find that to be problematic and I am not alone," Omar tweeted. "Our nation is having a difficult conversation." But Democrats insisted Trump was out of bounds to suggest their party was anti-Jewish. "As illustrated by history and yesterday's overwhelming vote to condemn anti-Semitism, there is strong support for Israel and the Jewish faith among Democrats," Congresswoman Elaine Luria, a military veteran who is Jewish, told AFP. There are currently 35 Jewish members of the US House and Senate, according to the non-partisan American-Israeli Cooperative Enterprise. Only two of them are Republican. The debate comes amid a rise in anti-Semitic incidents across the United States. The Anti-Defamation League reported a 58 percent increase in such incidents between 2016 and 2017. In October, a gunman killed 11 worshippers at the Tree of Life synagogue in Pittsburgh, in the deadliest attack ever on Jews in America. Trump proclaims himself as Israel's closest ally. He proudly moved the US embassy from Tel Aviv to Jerusalem, and has forged a close alliance with Prime Minister Benjamin Netanyahu. But he and other Republicans have also courted controversy with the Jewish community, and have been accused of trafficking in dangerous, age-old tropes about money that anti-Semites have used to attack Jews for centuries. Speaking to the Republican Jewish Coalition in 2015 during his presidential campaign, Trump said "you're not going to support me because I don't want your money." "But that's okay," he went on. "You want to control your own politician." Trump drew outrage in 2016 with a tweet showing his rival Hillary Clinton and a Star of David -- with words accusing her of being "corrupt" -- superimposed over a blanket of USD 100 bills. And his final main campaign ad before the 2016 election contained alarming messaging, with images of prominent financial figures George Soros and Janet Yellen, both Jewish, as Trump speaks of "those who control the levers of power in Washington." As president, Trump sparked a firestorm by saying there were "very fine people on both sides" at a white nationalist rally in 2017 in Charlottesville, where demonstrators chanted "Jews will not replace us."